A unique setting for the most important celebration of your lives! Private villas are so much more than just a holiday accommodation. They are a perfect host to a romantic wedding celebration with just the right amount of luxury. Whatever you’re searching for on your special day – having a wedding at one of our villas will most certainly be unique and memorable. Our specialty is organizing weddings in private villas with authentic looks, large outdoor spaces with pool, green gardens and stunning views to the sea. Whether you’re after a large, luxurious wedding or a small, intimate celebration in complete privacy we know the place for each. We are here to help you create a memorable, magical event that will exceed your expectations. Villa Unique is one of a kind estate with restaurant and marina, spread on 5000 square meters and located in the beautiful village of Maslinica on the island of Solta. It is a 300 years old castle recently restored and turned into a luxury facility. Restaurant, pool terrace and 5000 square meters of amazing Mediterranean styled garden makes Villa Unique a perfect wedding venue. 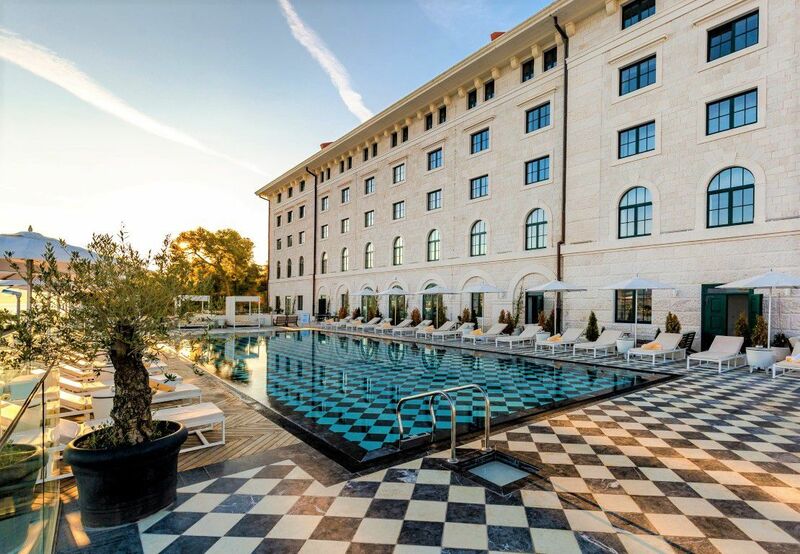 Hotel Star Trogir is a boutique design hotel set right on the beach and just a 10-minute walk from Trogir’s medieval old town. Outdoor heated infinity pool features an effective black and white tile floor that offers a unique experience at night visually transforming into a glittering blue surface. The hotel also has a large sun terrace with magical sea view, excellent Mediterranean restaurant and a bar, a banquet hall and spa area. Hotel Star Trogir features 43 spacious bedrooms with en-suite luxurious bathrooms and offers accommodation for 113 guests. It includes: accommodation in 43 rooms, buffet breakfast, welcome drink in lobby bar, unlimited usage of spa and pool, pool, restaurant & salon privatization in case of bad weather, party in any part of hotel until 3:00 AM, beach bar (2 hours), parking. Villas & rooms Infinity are an ideal place for celebration of your special occasions such as weddings, anniversary, birthdays, baptisms, communions, confirmations and engagements. The property consist of two villas, two stone houses and twelve double bedrooms, two outdoor swimming pools, restaurant and a bar and it is a suitable accommodation for 40 guests. There are also glamping tents in the proximity for another 50 guests in case you have more than 40 guests attending your memorable day. There are two Robinson houses that were built in 2014 and are set in an elevated location in a secluded bay. Private beach is s only 30 meters away from these houses and it is reserved exclusively for the guests. 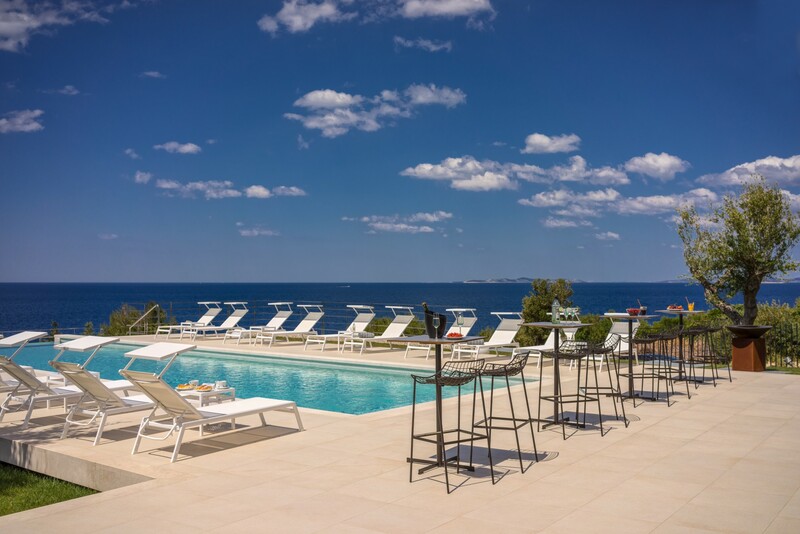 Luxury apartments Eloise are located within a complex of top luxury villas and apartments in one of the most beautiful areas of Central Dalmatia with crystal clear sea and wonderful pebble beaches. This VIP complex consist of 8 apartments and 7 private villas, ideal for sophisticated guests looking for luxuriously furnished, modern and fully equipped properties on a stunning location with private beach. It features a large infinity pool with stunning sea views and a bar, perfect to host a wedding ceremony. 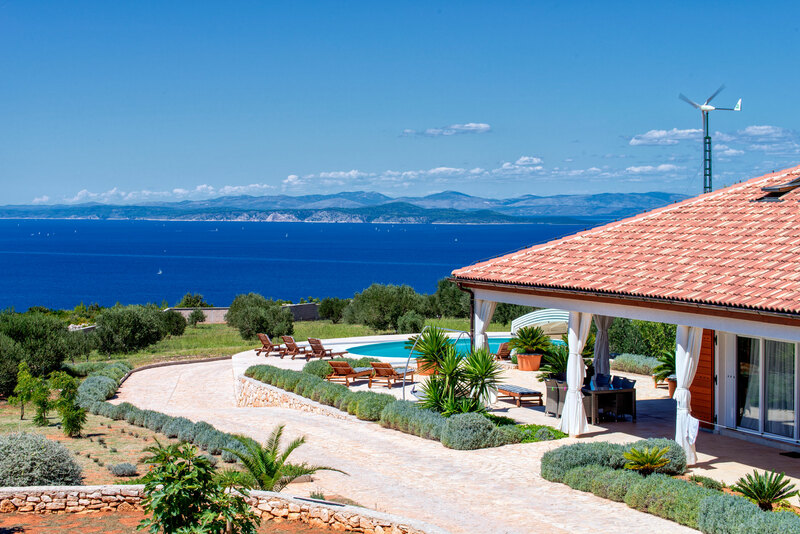 Villa Panorama Hvar is located on top of the hill above city of Hvar and spread on 7000 square meters of complete privacy. 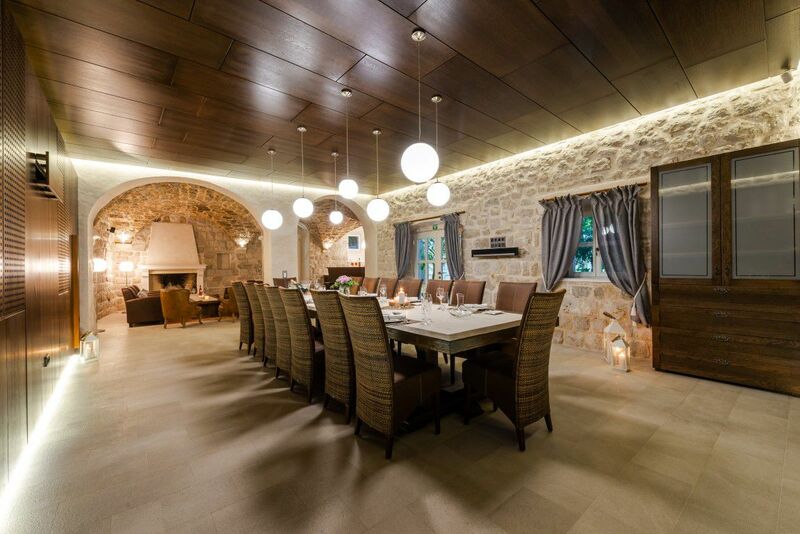 Villa is surrounded by stone walls, private olive grove and greenery and it’s one of the most exclusive villas on the sunniest island of Croatia. Villa Panorama Hvar is an ideal wedding venue as it is positioned above city of Hvar and offers a stunning panoramic view and unforgettable sunsets that will make the wedding day and the photos magical. Since there is no neighbors around, there is no limit for the music. Villa Island is located in the beautiful village of Humac, 30 minutes away from the town of Hvar. Total plot area extends over 30000 square meters and apart from natural beauty this completely enclosed plot offers recreation activities with basketball, tennis court and bocce field. Villa Island is a perfect holiday villa, set in quiet location away from rush and noise. On the other hand, there is plenty of activities to fulfill your time and enjoy with your friends and family. All this makes Villa Island a perfect wedding venue, completely private and with stunning panoramic sea view. 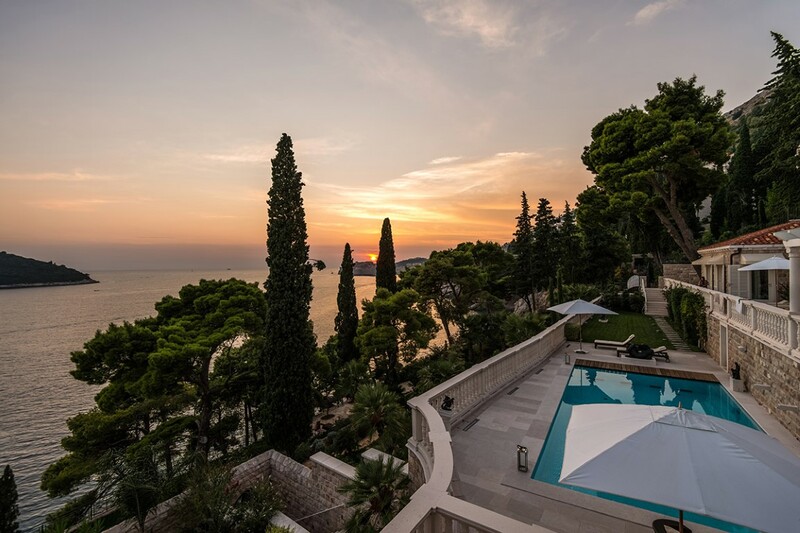 Villa Rustica Hvar is a unique villa set ideally – between Stari Grad and Vrboska and only 800 meters away from the sea, a place where you will find the perfect balance of serenity and adventure. Villa is completely isolated which means no neighbors nearby and no noise of any kind. All this makes it perfect for a wedding celebration especially since it’s spread on 8500 square meters surrounded with Mediterranean garden. 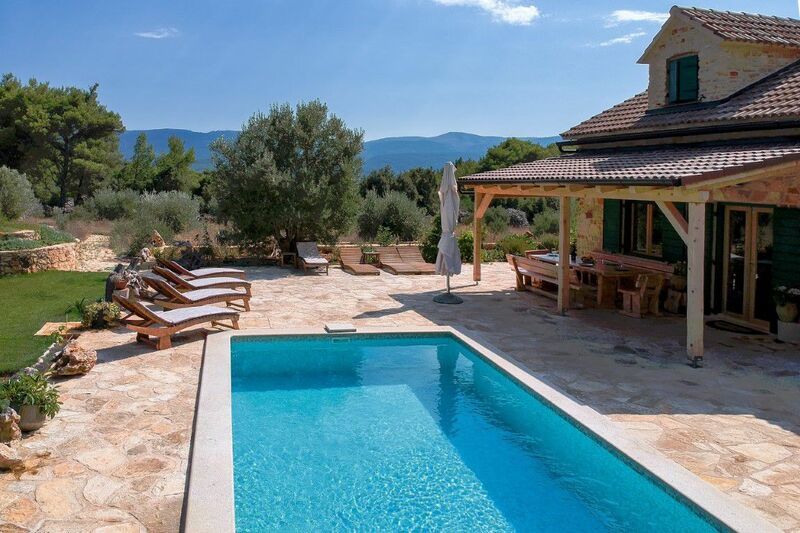 Villa features heated pool, surrounded by stone terraces and greenery. 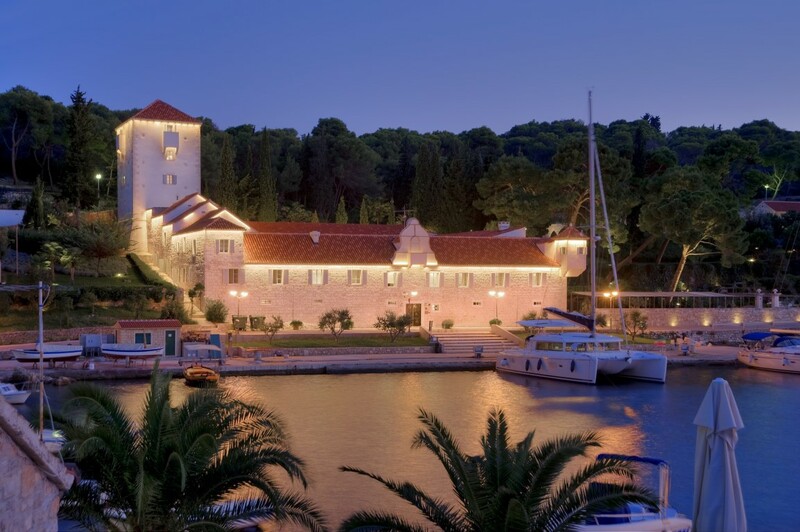 Villa Harmony Hvar was originally built in 1612 and carefully renovated between 2007 and 2009, strictly respecting the rules of the Institute for the Protection of Cultural Monuments, so today it stands as a heritage monument. It is located in the historical heart of Hvar town. Villa offers wellness facilities and a private wine cellar. Indoor heated swimming pool is surrounded by the sliding glass walls which make it transformable into outdoor season pool. Villa Premium Dubrovnik is a unique villa located on a breathtaking location in the elite part of Dubrovnik, only 500 meters from Old town center of Dubrovnik and just 5 meters away from the beach. Villa was built to exceptional standards in ultra contemporary design while preserving the style and charm developed by the original architect combining all the comforts of modern living. It features an unforgettable view to the sea and a large Mediterranean garden that surrounds the whole property. It is spread on 8000 square meters of private property with 700 square meters living space. 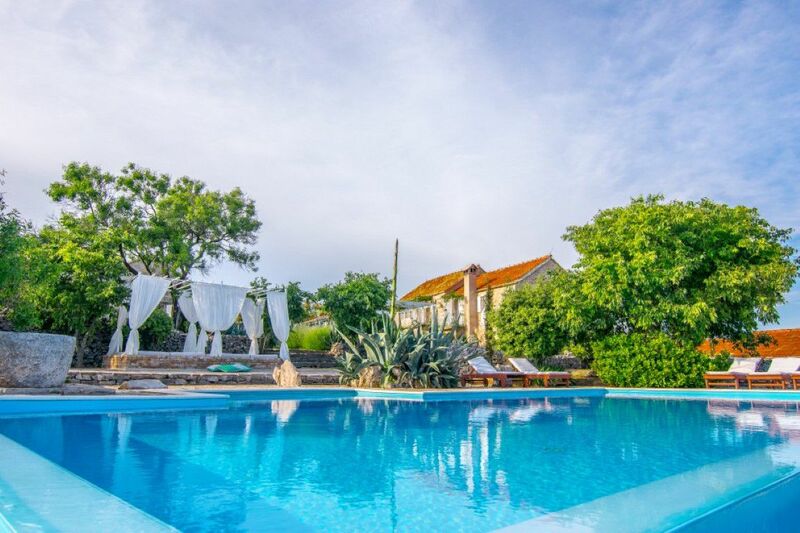 Villa Zaton Heritage Mansion, centuries old summer estate surrounded by high stone walls is situated in a quiet and picturesque bay of Zaton, 10 minutes driving distance from Dubrovnik. Villa’s impressive interiors, spacious gardens, large swimming pool, beautiful sea view terrace with glass bridge leading to it and a small chapel inside the walls, make this villa a unique vacation estate and the ideal wedding villa. Behind the main house, entirely secluded by high stone walls, incredibly scented, quiet and private Mediterranean gardens extend at over 1500 square meters. Wedding surcharge: 50 % of nightly price + additional 2.000,00 € as damage deposit that is returnable. Villa Sea Breeze Orasac is located on the hillside town of Orasac, only 10 km from Dubrovnik and only 800 meters away from the beach. This beautiful villa is surrounded by greenery, overlooking the Adriatic sea and it’s a place to completely relax and unwind. Private terrace features an outdoor swimming pool with sunbeds around overlooking the sea. In the pool area there is spacious pergola and a rustic covered pavilion with summer kitchen and fireplace / barbecue pit and an outdoor dining area for 14 people. This one of a kind vacation villa on a lighthouse was built in 1871 and renovated to provide unique and luxurious experience. It is positioned on a small island near Korcula. All around this lighthouse there is only crystal clear sea, endless sky and utmost privacy. Villa is fully equipped and features a swimming pool, indoor Jacuzzi and a completely private beach. 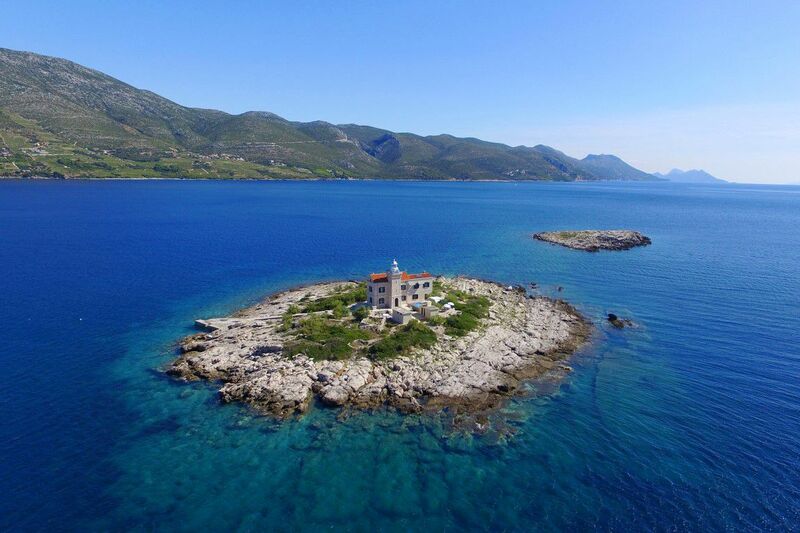 Lighthouse Korcula is the right place for those who want to have a special and intimate wedding on a unique location as it makes a perfect wedding venue. 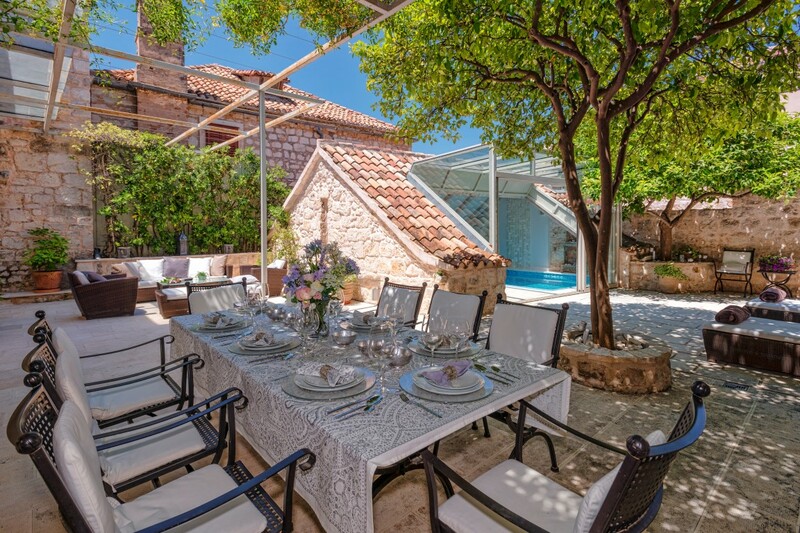 Villa Royal Trogir s a magnificent villa situated on the island Ciovo, Trogir area. It is located on a large plot of 1500 square meters, enclosed with hedge with large heated swimming pool in the middle. Beautiful palms, greenery, interesting features like white local stone and unique balconies make this villa exude with soothing sophistication. It is fully equipped and features a heated swimming pool, plunge pool, spa and fitness area, game room, wine cellar and is set right on the beach. Villa Royal Trogir offers complete privacy and peaceful holiday experience in Dalmatia as well as a wonderful villa wedding location. Villa Grande Pirovac is located in the small town of Pirovac near Sibenik, surrounded by the untouched nature. It is ideal for a luxury vacation in a secluded and private location and for an intimate and luxurious wedding. Small, quiet beach is right in front of the villa. Terrace features an outside dining area with bar and barbecue, sunbathing area and swimming pool. Together with the lounge area and greenery all around, it makes this outdoor living area ideal for wedding ceremony and dinner. Surrounded by a well maintained spacious garden and large swimming pool on a wide terrace in complete privacy, Villa Green Zadar represents a true relaxing holiday oasis and a perfect wedding venue for up to 100 guests. Outside area of Villa Green Zadar comprises a spacious terrace with large swimming pool, beautiful garden and a lawn ideal for enjoying your holiday outdoors to the fullest. Next to the main villa there is a garden house with another fully equipped kitchen. Villa Provansa Istria is the ideal choice for your special day. 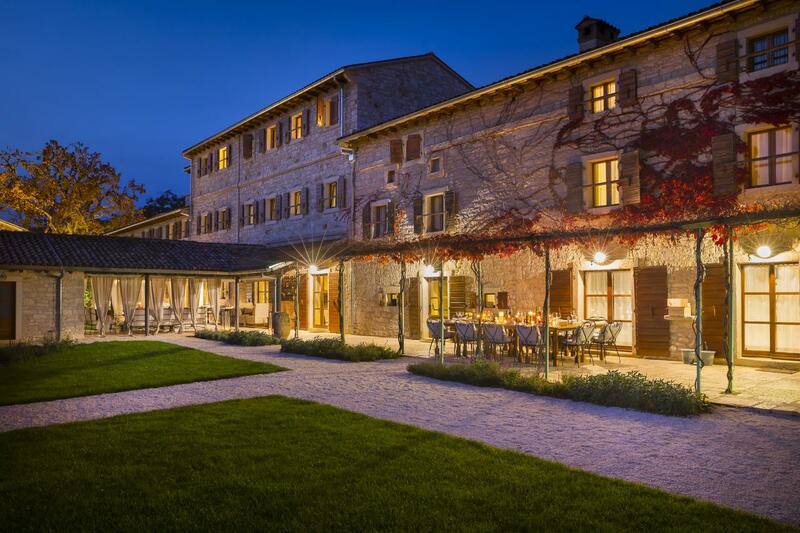 Luxurious wedding venue in Istria ideal for romantic weddings offers you just the right amount of luxury, elegance and class. Villa features 39 luxurious accommodation units from 25 to 150 square meters and offers accommodation for up to 139 guests. Large private property, restaurant on site, 3 swimming pools, gym and spa area are only a glimpse of what this villa offers. It includes: usage of all rooms and residences, buffet breakfast, usage of all facilities: indoor and outdoor pools, tasting room and staff. Renovated old stone villa with pool and fantastic view, Villa Magic Motovun is something special. 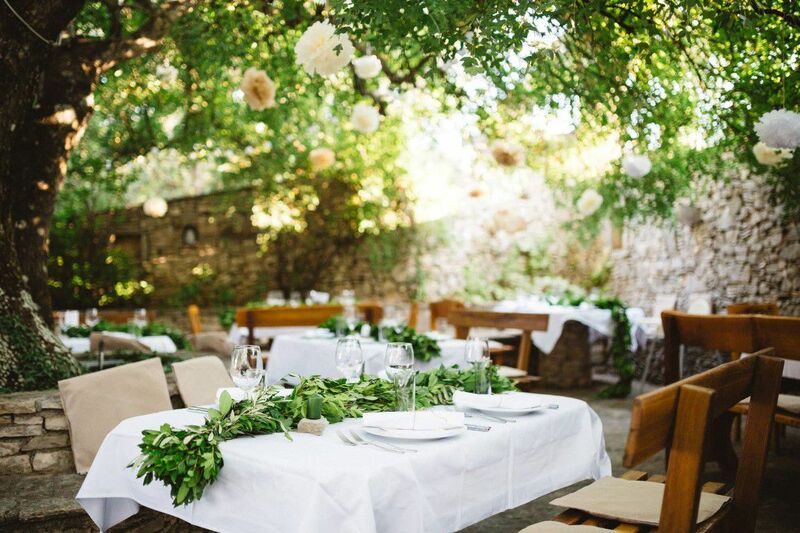 Located on the hill, above the River Mirna valley, surrounded by vineyards and made of beautiful medieval stone, with spectacular view is ideal place for your wedding celebration. Located on a completely private location, surrounded by nature from all sides, this villa is perfect for recharging your batteries and enjoying complete serenity. Private plot of 50 000 square meters with swimming pool and Jacuzzi is just an introduction to this beautiful story.